I ran a Patreon poll about sociological theories as applied to urbanism, offering two options: cultural theory of risk, and cultural cringe. The poll was tied, so I feel compelled to do one post on each (when cultural theory was ahead I was outlining two separate posts on it, one about transit and one about housing). Psychologists and sociologists have long known that people’s perceptions of risk can vary widely from actual risks (e.g. people are more afraid of flying than of driving even though planes are safer), and, moreover, different people have different evaluations of risk. Early theories analyzed differences in risk perception along lines of class, race, or gender, but subsequently a group of social scientists, many (though not all) libertarians, argued for an ideology-based cultural identity. In 1982, the anthropologist Mary Douglas and the political scientist Aaron Wildavksy published Risk and Culture, arguing for three different identities (later expanded to four). Douglas used her past insights from analyzing premodern societies’ social taboos to analyzing risk perception within industrialized societies, especially the rise of the environmental movement during a time of falling pollution levels. Urbanism and public transit are intimately connected with environmentalism. A large fraction of transit advocacy is environmental in nature, and both early NIMBYs and present-day YIMBYs come from green progressivism. Even when the arguments are not explicitly ecological, the parallels are unavoidable: Jane Jacobs’ critique of urban renewal has strong similarities with Rachel Carson’s critique of DDT. Legally, the mechanisms that exist to protect both endangered species and neighborhoods are often the same (e.g. the American environmental impact report process). Thus, understanding a sociological theory developed originally to analyze environmentalism should have straightforward applications to cities and urban transportation. Group measures group solidarity among members of the system; grid measures the restrictions placed on the individual’s ability to exit the system. 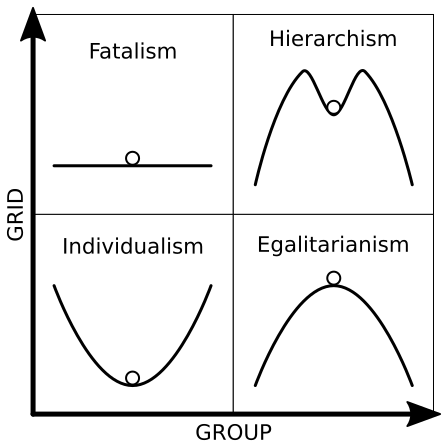 While individualism and hierarchy are politically stronger than the other two cultural identities, group and grid are fairly independent on the level of personal politics and there are numerous examples of egalitarianism and fatalism. I strongly recommend reading the original book, but this review does it and the theory’s subsequent developments justice. Individualism arises in institutions that are atomized and like it. The free market is the best example, but professions with mostly independent workers (like academia and the law, especially historically) also fit. Individualists view nature as resilient, returning to a stable equilibrium no matter what happens, and thus business control of the environment is to be celebrated as development; I had this aspect of cultural theory in mind when I wrote one of my early posts critiquing the idea that cities have a single equilibrium. Rejecting systemic or environmental risks, individualists focus on risks that disrupt the market’s operation, like war or recession. Hierarchy arises in institutions where everyone has a predetermined role to play. Examples include the military, premodern feudalism, and modern bureaucracies. Hierarchists view nature as perverse or tolerant, capable of adapting to change to an extent but not beyond circumscribed limits, and therefore employ what their society considers expert opinion (e.g. scripture, bureaucratic process, big science, etc.) to figure these limits. Hierarchists focus on risks that indicate social deviance, like crime. Douglas and Wildavsky call the above two tendencies the center, distinguished from what they call the border, whose growth they ascribe to the erosion of trust in institution in the 1960s and 70s (coming in the US from the Vietnam War and Watergate, in France from the reaction to the social protests of 1968, etc.). Egalitarianism was the border tendency studied in Risk and Culture, which polemically called it sectarianism. It occurs in groups that rely on intensive solidarity among members but cannot enforce their collective will on the individual, and thus require other mechanisms to encourage people not to leave. These include internal equality, to stave off discontentment, and the precautionary principle, to prevent change from inducing disaffected members to exit. Thus they view nature as fragile, prone to collapse at any moment if the system endures any change in direction, and focus on low-probability, high-impact risks (such as environmental collapse), which enhance the group’s internal solidarity against outside enemies. One of the key oppositions Douglas and Wildavsky point out is between the Hutterites and the Amish. Both denominations are high-group, socializing almost exclusively among their own kind, adhering to strict religious principles. But despite their common Anabaptist origin, they differ in one crucial aspect: the Hutterites have communal ownership of property, the Amish don’t. This makes the Hutterites high-grid, since members who leave start from zero, whereas Amish who leave get to keep their land. The Amish openly adhere to the precautionary principle, which they famously interpret extremely conservatively; the Hutterites have formal rules for group size and adopt modern farming technology easily. Fatalism is the last tendency, so politically weak that it was ignored in the original book and only discussed in subsequent refinements of the theory. It arises in institutions whose lower-ranked members (whether by market poverty or low rank in the hierarchy) are disaffected, unable to leave and yet not sharing any of the group’s purported values. They tend to view nature as capricious, moving without clear direction, and do not have any particular risk focus, but tend to be especially concerned about things they do not understand (such as unfamiliar or complex technology). Transgressive fiction like The Wire tends to depict fatalist institutions; geekier readers may also recognize H. P. Lovecraft’s mythos as fatalist, portraying a universe so far beyond human understanding that any who begins to figure any of it out goes insane or slowly becomes a monster. Some political movements have obvious cultural identities. Libertarianism is individualist. The New Left is egalitarian. The far right is hierarchist: Cas Mudde calls it pathological normalcy, and its issue focus (crime, immigration as genetic pollution, terrorism) is hierarchical, even as it rejects traditional hierarchical institutions. However, the broader left vs. right distinction does not neatly map to any of the four cultural biases. About the only generalization that can be made is that activists are usually not fatalists. Transportation planning is an inherently hierarchical industry. The technologies involved are old and continuously tweaked within well-understood parameters. With so much accumulated knowledge, work experience matters, requiring companies in the industry to adopt a hierarchical setup. Moreover, the transportation network itself is complex and interconnected, with changes in one region cascading to others. Changes to the bus network, the train schedule, etc. are possible but only if the people implementing them know what they’re doing, creating a picture of the network much like the hierarchical view of nature as tolerant up to a limit. The individualist ethos of tech companies – move fast and break things – works for fast-growing industries. Individualism is by far the fastest of the four biases in reacting to sudden changes. The tech industry’s denigration of public transit as an old hat has to be understood as individualists reacting poorly to an industry that has to be run by a business culture they find alien. Readers who have been following me closely may ask, well, what about me? I’m an individualist. I evidently talk more to startups than to transportation consulting megacorps. One reader notes that I’ve called for people in positions of authority to be fired for incompetence so many times that a post like this one may read as hesitant purely because I only call for removing the governor of Massachusetts and the secretary of transportation and not also for firing planners. The answer is that while there is extensive accumulated knowledge about good public transit in Western Europe, Japan, and South Korea, there is very little in the area I’m most involved in, North America. This is especially true when it comes to regional rail: the existing mainline rail in the US should be treated as more or less tabula rasa. Adopting best practices requires extensive expert knowledge, but the methods in which they should be implemented have little to do with the internal bureaucracy of hierarchical organizations, since the railroads that would ordinarily be in charge (like the LIRR or the MBTA) are the problem and not the solution. But if the actual process of running a transportation network is hierarchical, the politics are completely different. As with left-right politics, the politics of public transit don’t neatly fit into any of the four tendencies. Center-right hierarchists tend to support extensions of the status quo, which means more urban transit in New York, London, Paris, and other large cities, as well as high-speed rail on strong corridors (High Speed 2 in the UK is bipartisan), but more roads everywhere else. Individualists on the right tend to be anti-rail, partly because it looks so hierarchical, partly because of peculiarities like Koch funding of American libertarianism (which has been exported to Israel, at least). Egalitarian environmentalists tend to be pro-transit, but their discomfort with hierarchy sometimes shows up as mistrust of big infrastructure projects. The radical environmentalist Chris Clarke, opposed early attempts to fast-track California High-Speed Rail and called Robert Cruickshank of California HSR Blog a shill for developer interests. Jane Jacobs herself ended up arguing late in her life that mass transit was at the wrong scale and instead cities should encourage community jitney services. The process itself has issues of trust that activate egalitarians and fatalists, the latter often reflexively opposing reforms since they assume things must always get worse. It leads to tension between community outreach, which helps defuse this opposition, and speed of implementation. Whereas transportation politics isn’t neatly slotted into the grid-group paradigm, the politics of urban development is: YIMBY is an individualist movement, with near-universal support from people who identify with that cultural bias. The other three tendencies are split. The market urbanist proposition of abolition or near-abolition of zoning doesn’t appeal to hierarchists (who want to be able to control where housing goes) or egalitarians (who worry about the consequences of empowering market actors); but there are egalitarian left-YIMBYs and hierarchical city leaders who favor transit-oriented development. In fact, when analyzing NIMBYism, it’s useful to slot it not by class or political opinion, but by cultural identity. There is much less difference between working-class and middle-class NIMBYs than leftists posit, and in some cases anti-gentrification politics and racist opposition to fair housing blend together (as in South Tel Aviv, where the local far right has argued black refugees are part of a gentrification ploy). The key is that egalitarianism really consists of two distinct concepts, both necessary to maintain high group solidarity without grid: internal equality, and strong boundedness (which refers to sharp distinctions between insiders and outsiders). The cultural geographer Stentor Danielson argued once that surveys consistently show people approve of internal equality but not of strong boundedness, which is why egalitarian communities are so rare even though many people agree with most of their tenets. Thus, when NIMBYs argue that more development would bring outsiders or change the character of the neighborhood, this is as compatible with egalitarianism as with hierarchy. Gentrification is just the name for when these outsiders are not begging for scraps. The real difference is in where this is taken. Egalitarian NIMBYism emphasizes irrevocable change, high-impact risks (e.g. that a new development would induce runaway gentrification), and trust. Hierarchical NIMBYism instead talks about behavioral norms, usually referring to middle-class moral panics about crime, but occasionally flipping to black American fears that white people would call the police more often. The fatalists, too, have their own criticism of redevelopment – namely, that it represents another sudden change involving forces they have no control over. “Nobody asked us” has to be understood as a fatalist and not egalitarian cry, even though egalitarians often try to organize fatalists. It’s not really possible to promise any of the other groups what it really wants: protection from change for egalitarians, a more concrete relationship between development and their actual lives for fatalists, or ethnic or other kinds of homogeneity for hierarchists. Nonetheless, alliances are possible with some egalitarians and hierarchists. SF YIMBY has to be viewed as an attempt at an individualist-egalitarian alliance for more housing, ceding ground on rent control to curry favor with ideological socialists (and its East Bay offshoot is run by actual socialists). In the other direction, Theresa May’s making noises about releasing more land for housing to get young people on the “housing ladder,” invoking a hierarchical sense of normality regarding when it’s appropriate to buy a house. There is nothing in this post specifically that I can point to as incorrect, in fact it strikes me as perceptive. But I am left with a bitter taste in my mouth because it sort of concedes fatalistically that everything is hopelessly polarized and the only way forward is either for one group to dominate the others or for an alliance between two or more groups to agree on a very narrow platform. I would certainly resist the notion that I fall cleanly into any one of those four categories and perhaps I am naive but I believe it is possible to reconcile some of the best aspects of each of them (well, maybe not reactionary fatalism…) into a coherent world view and a corresponding set of policies. ^ It’s a model for understanding cultures, not an exact roadmap. Different cultures may have different blends of these attitudes and different individuals may hold different attitudes as well. I think the relative developer-friendliness of Chicago can probably be traced to most Chicagoans holding a fatalist attitude surrounding development. It would explain why architecture is often dumbed-down compared to peer cities, but also why we build so much more of it, not just downtown but scattered throughout countless neighborhoods. Developers are just trying to blend in and avoid becoming a lightning rod, whereas in other cities developers are striving for excellence to justify the perceived negatives of new development. It’s the same kind of attitude you see in lots of greenfield suburbs. The minority of Chicagoans who attack new development on egalitarian grounds often cite the ugly architecture – their judgment lacks any nuance, but they’re not wrong on the whole.